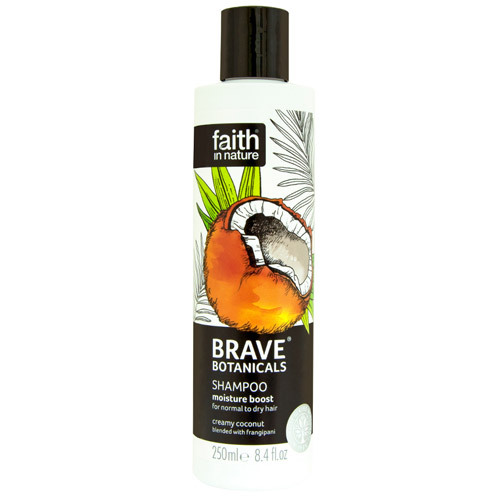 Faith in Nature Brave Botanicals Coconut & Frangipani Shampoo contains organic coconut oil infused with exotic frangipani to cleanse hair, helping it to look and feel both hydrated and revitalised. Delicious, sweet and creamy notes of coconut are blended and surrounded with a heart of lush and rich frangipani - a delicate flower found in the Caribbean, to create a truly tropical and uplifting aroma. Aqua (Water), Ammonium laureth sulfate*, Cocamidopropyl betaine*, Maris sal (Sea salt), Polysorbate 20*, Cocos nucifera (coconut) oil**, Glycerin*, Plumeria rubra flower extract*, Avena strigosa seed extract*, Tocopherol*, Panthenol, Sodium PCA*, Glyceryl laurate*, Disodium cocoyl glutamate*, Sodium cocoamphoacetate*, Guar hydroxypropyltrimonium chloride*, Cocodimonium hydroxypropyl hydrolyzed wheat protein***, Lecithin*, Sodium cocoyl glutamate*, Helianthus annuus (sunflower) seed oil*, Parfum (Fragrance)*, Sodium benzoate, Potassium sorbate, Citric acid*, Benzyl alcohol*. Massage gently into wet hair, rinse well and repeat if required. For frequent use. Below are reviews of Faith in Nature Coconut & Frangipani Shampoo - 250ml by bodykind customers. If you have tried this product we'd love to hear what you think so please leave a review. I love this shampoo and the conditioner too - I have very sensitive skin and most shampoos make my scalp itch, but this doesn't at all. It is moisturising without making your hair feel greasy and has eased my frizz. I won't use anything else buy Faith in Nature now. This shampoo not only smells amazing but left my dry, frizzy hair really soft and shiny. I also used the coconut and frangipani conditioner.